This sample 11 day (10 nights) itinerary covers the highlights of Eastern Germany and Bavaria: Berlin, Dresden, Nuremberg & Munich. The services we provide as part of our comprehensive packages include accommodations, train tickets, transfers (airport and some train station) and city tours. In addition to the tours included we can arrange a number of excursions based on your own interests. There is also an option to travel between cities by private car or van transfers at an extra cost. Our Destination Manager in the region provides assistance before and during your travels. They will be available to you leading up to the trip to answer any questions and arrange local services. You will be provided with information on the best these destinations have to offer including things to see and do, restaurants, entertainment and other insider tips. Upon arrival we will provide you with a local cell phone that you can use to contact our Destination Manager throughout your trip. In all of our destinations we offer a variety of accommodation options including boutique style hotels, charming B&Bs and spacious apartments ranging from a three to five star level. From our first hand experience we can ensure they are all clean, comfortable and centrally located. We generally discourage chain hotels but provide accommodations with unique features or an authentic feel. Welcome to Berlin! You will be met at the airport and have transport arranged to your centrally located accommodation. Today you'll be taking a group walking tour. 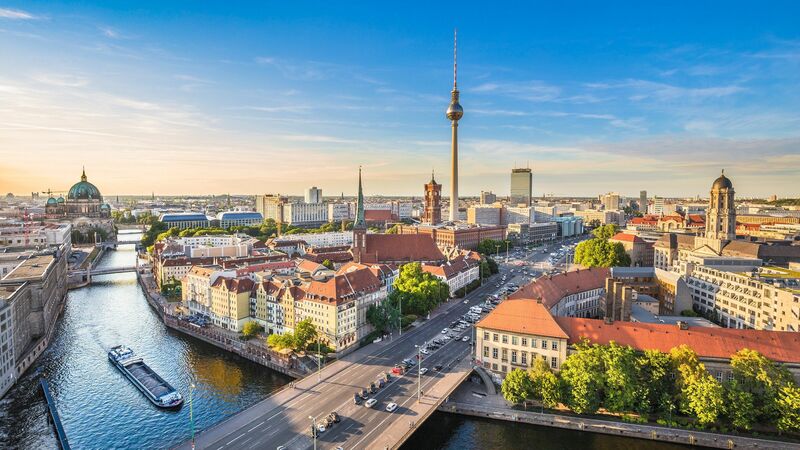 You’ll stroll down Berlin's royal boulevard and retrace the city's evolution from a pagan fishing village into the capital of Prussia, and the capital of Bismarck's German empire. Your guide will help you discover the memorial for the Nazi book burning close to where Marx studied and Einstein taught. Walk across the final battlefield of World War II and find out how the peculiar events surrounding the Reichstag fire led to the Nazis' rise to power in 1933. Stand at the site of Hitler's bunker and get an in-depth account of the claustrophobic last days spent inside. You'll also explore the controversial Memorial to the Murdered Jews of Europe. Berlin in the summer is a real treat, as you have the combination of the rich history and a spectrum of outdoor entertainment. Today we suggest exploring some of the city’s outdoor life. The Tiergarten is the city’s largest park and is centered around The Victory Column, which offers incredible views over the city. Many neighborhoods throughout the city also have beer gardens, where you can enjoy a cold pilsner in classic summer style. Areas such as Kreuzberg are also great places to wander when it’s warm. You’ll find outdoor dining and drinking, markets, and more. Berlin’s Museum Island (Museumsinsel) is a magnificent total art work, a truly outstanding ensemble of five world-renowned museums. Apart for the legendary bust of the Egyptian queen Nefertiti, the most famous and important cultural exhibits on show here include the breathtaking Pergamon Altar and the stunning Ishtar Gate. In 1999, the Museum Island complex was inscribed on the UNESCO World Heritage List. Much of Berlin was destroyed in the closing stages of WWII, and most of the buildings that were subsequently rebuilt were the city's more historic landmarks but some of the creations of Adolf Hitler's top architect Albert Speer survived the bombs and shelling and the ravages of time since to still stand to this day. You can take a self-guided exploration of these Nazi-era buildings by following the map in this article. Discover a very different German city - Dresden. Regular train connections between Berlin and Dresden mean you can choose your departure time. Your hotel reception will be able to arrange a taxi for you to Berlin's Hauptbahnhof station, much more economically than a transfer service, so we haven’t included that in your package but can do should you wish. Once on the train all you need to do is unwind and watch the German countryside speeding by. Your package includes second class tickets with seat reservations, upgrades to first are available but are much more expensive. A vibrant cosmopolitan city that’s rich in history and contemporary culture, Berlin is a place that is constantly evolving. From the ruins of World War II to the Cold War division of the Berlin wall, Berlin has always emerged intact. The largest city in Germany and the capital of the country, this is a sprawling city that luckily has a very comprehensive system of public transportation, both above and below ground. You’ll find a little of everything here, from history to high gastronomy, art museums to palaces, and plenty lively bars. The nightlife here is world-class, but there’s more than enough to see during the day. Berlin is made up of distinctive neighborhoods, and each of them has a different character. We recommend several ways of exploring the city, from a Cold War walking tour to a bike tour to see all the must-see sights in a simple and easy way. An exploration of the long and volatile history of Jewish culture in the city is eye-opening as Jewish life in Berlin has been meticulously documented. Many of the city’s art and culture museums offer unforgettable glimpses into history. Potsdam offers the perfect diversion for an afternoon, and Sanssouci Palace, with its well-tended gardens, is a beautiful reminder of the city’s impressive past. The past comes alive in Berlin, but the present is very much alive as well. When you arrive at Dresden Hauptbahnhof you will easily find the station’s taxi rank signposted. We haven’t included a transfer here because in our experience meet & greet transfer services in Dresden are very overpriced, unreliable and the driver can be hard to locate in the station. Dresden's taxis are honest, reasonably priced and you’ll have no problem finding one at the station’s taxi rank, so you’ll save both time and money by taking one to your centrally located accommodation. Today you'll be setting out on a private walking tour of Dresden. Your guide will meet you at your accommodation at the agreed upon time. Wear comfortable shoes and don't forget your camera! Meissen is a quaint German city that is one of our favorite destinations for a day trip outside Dresden. Here you can explore a 15th century castle and cathedral, and also admire the lovely architecture and cobblestone streets. The city is world-famous for its porcelain, so a visit to the factory shop should definitely be on the agenda. Domkeller and Frauenkirche are Meissen's two famous cathedrals, and each is beautiful. You'll love settling into the slow pace of life here. For more information about Meissen, please read our blog post. Despite, or because of, Dresden's almost complete destruction during World War II, it is a city that takes history seriously. The best museums in Dresden rank among the finest in Germany. Here are some of our favorite. The Gemaldegalerie Alte Meister has an international reputation since it has one of the most impressive collections of Italian Renaissance masterpieces in Europe. One of the most famous collections of porcelain in the world, the Royal Porcelain Collection was started by King Augustus II and has been kept up to date with recent acquisitions. The Deutsches Hygiene Museum is one of the most unique museums in Dresden. You can look forward to exhibitions, lectures, discussions, readings and much more. The Transport Museum Dresden is the best museum in Dresden for those who love automobiles and machinery, or families traveling with children. Located near Dresden's Academy of Fine Arts, the Albertinum is a gallery dedicated to modern art, as opposed to the Old Masters at the Gemaldegalerie. There's a great collection of sculpture as well as Romantic-era art and works from contemporary artists. Founded in 1723, the Green Vault boasts the largest collection of artistic and cultural treasures in Europe. Restored after being heavily damaged in World War II, the museum consists of old and new sections dedicated to the original collection and newer acquisitions. While it's not a museum per se, few buildings in Dresden pay more stunning homage to the city's history than Frauenkirche. Destroyed during World War II, the church has since been rebuilt. The dark spots on the facade are bricks from the original church. Today you're taking the train from Dresdeen to Nuremburg. There are a number of departures throughout the day. Unfortunately there are no direct trains but most connect in Leipzig and you will have plenty of time to change trains. We will include standard class tickets in your package. The train journey takes a little over three and a half hours. We haven’t included a transfer to the train station here because in our experience transfer services in Dresden are very overpriced. Dresden's taxis are honest, reasonably priced and you’ll have no problem arranging for one with your hotel reception. Dresden has had one of the most volatile histories of any city in Europe, being almost totally reduced to rubble in World War II. The city today is a unique combination of remembered and honored history and a vibrant, entertaining present. 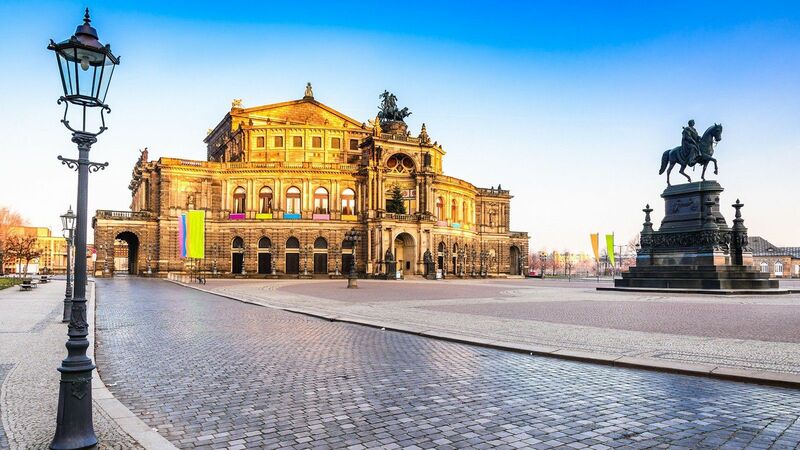 There are several historical buildings throughout the city that attest to the destruction here, but Dresden has rejuvenated itself since World War II, and today is one of Germany’s most tourist-friendly cities, with an enchanting energy and entertainment all year round. Famous for its Christmas markets, Dresden also has plenty to offer in the warmer months, from museums and memorials, to intriguing new architecture, pleasant parks, and nearby destinations for day trips. History comes alive everywhere you look in Dresden, and we highly recommend taking a closer look at the city’s museums and the traces of the past in the architecture. The city also has a rich cultural program, with numerous galleries and concert taking place quite regularly. You can certainly sample hearty German cuisine here, as well as more modern Continental flavours. You’ll love exploring this lovely city and the surrounding region. When you arrive at Nuremberg Train Station you will easily find the station’s taxi rank signposted. We haven’t included a transfer here because in our experience meet & greet transfer services in Nuremberg are overpriced, unreliable and the driver can be hard to locate once you arrive. Nuremberg’s taxis are honest, reasonably priced and you’ll have no problem finding one at the station’s taxi rank, so you’ll save both time and money by taking one to your centrally located accommodation. This four-hour tour will give you deep insight into Nuremburg's World War II history. With an expert local guide you'll tour the Nazi Rally Grounds and the court where the infamous Nuremburg trials took place. It's a chilling reminder of one of the most disturbing chapters in 20th century history. Your guide will answer all your questions as you see the sights. This is an indispensable tour for history buffs. You're off to the Bavarian capital today. We'll include standard class train tickets in your package for one of the regular high-speed (just over an hour) services from Nuremburg to Munich. We haven’t included a transfer here because in our experience transfer services in Dresden are very overpriced. Dresden's taxis are honest, reasonably priced and you’ll have no problem arranging for one with your hotel reception. Nuremberg in northern Bavaria, is famous for its well-preserved medieval architecture and delicious local food. Head to the Old Town to see its houses, stone towers, and fortifications, and to marvel at the Schöner Brunnen ("Beautiful Fountain") located in the "Hauptmarkt" main square. Kaiserburg castle is the most famous place to visit here, with its impressive insight into the city's history. But, there is so much more to Nuremberg; this is a lively modern city with lots of interesting museums, different festivals and events and a great variety of international cuisine. 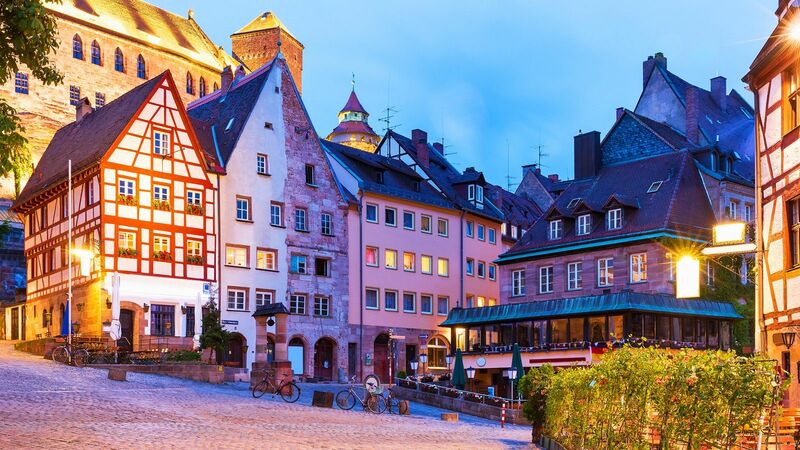 Even among Germans, the city is known for its beer, sausages, and gingerbread, so come hungry! You will be greeted at Munich Hauptbahnhof when you arrive and brought to your city center accommodation. Today you’ll be taking some of your first steps through Munich in the company of an expert private guide. This 3-hour tour offers a short, sharp and comprehensive overview of the major places to see in the historic center. You’ll be taking in all the key historical sites, the most beautiful churches, and the most famous beer halls. You won’t ignore the more sinister aspects of 20th century Nazi history, but you’ll see the better face of this lovely city as well, and hear the best stories and most interesting facts. Munich is a place with many identities: The heart of medieval “Old Europe,” the beer capital of the world, the “northernmost Italian city,” the Athens of the Alps, a great royal capital, and the location of some very tragic history. Munich has been the playground of royalty and the common citizen alike. It has inspired artists, writers, architects, musicians, scientists, more than one madman, and many visitors. You’ll see it all on your tour. One of the most impressive sites near Munich is the magnificent Neuschwanstein Castle. We recommend exploring it with a full-day excursion. You’ll travel by train about 2 hours from the city to the Old World town of Fussen in the foothills of the Alps, and head up to the castle’s lofty perch. Your guide will take you through the castle but also show you the best of the surrounding countryside. At the end of the day you’ll hop on the train back to Munich. World War II is one of the darker sides of Munich’s history, but one that remains fascinating. Today we recommend a tour of the Dachau concentration camp, just 18 kilometers from Munich. You’ll have a professional guide trained and authorized by the Memorial Site. The guide will organize all travel arrangements, bring you there and back by train, and give you a comprehensive tour of the surviving original buildings, the museum exhibition center, and the cinema which screens an English-language documentary. You’ll depart from Munich’s Central Train Station and return there approximately 5 hours later. Based on your departure time, a driver will pick you up from your accommodation and take you to the Munich airport. With its traditional beer halls, designer shops, trendy restaurants and international business, Munich is a mix of old and new, German and cosmopolitan. Largely rebuilt after World War II, the city still retains its old world charm, even in the midst of expansion and modernization. You’ve probably heard of the city’s world famous Oktobertfest, a once-in-a-lifetime party dedicated to that incredible Bavarian beer along with some of the local delicacies, including the tasty schnitzel. But there’s much more to Munich than drinking, and on your holiday you’ll have the chance to discover the best this charming city has to offer. Don’t miss out on the beer halls and the breweries, but be sure to get off the beaten path to discover a Munich of your own. Much of the city’s past centers around World War II, and there are several ways you can explore this chapter of Munich’s history, including a daytrip to the Dachau concentration camp and a special tour focusing on Hitler and the local activities of the Third Reich. Munich is also a center of industry and there is nowhere better to experience this than BMW World. Moving slightly farther afield, Neuschwanstein Castle makes the perfect daytrip, perched high in the hills over a verdant valley. Munich’s variety means there’s more than enough to satisfy even the most diverse groups of travelers. Let your curiosity guide you as you explore this unique German city.